Coffee and two side tables by California Modern designer Frank Rohloff. 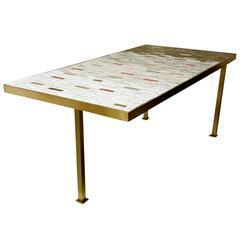 Coffee table by California modern designer Frank Rohloff. Handcrafted 1960s mosaic tile top table. Fish motif, metal legs, stunning vibrant coloring. Measuring 48 in L x 20 in D x 16 in H.
1960s walnut and glass elegant coffee table, good condition consistent with age and use.